February 2013 - Touch Display Research, Inc.
On Feb 20th, Korea Times reported that LG Display has dropped its injunction against Samsung Display Corporation. Samsung and LG have had a fierce competition for decades. Recently the Korean government has become involved and ordered the two companies to talk to each other. Several weeks ago, Samsung dropped its lawsuit against LG Display over OLED technology. Yesterday, LG Display dropped its lawsuit against Samsung over IPS LCD technology. The announcement comes after Samsung surprisingly decided to adopt LG’s white OLED plus color filter technology. According to Samsung officials the company will start the manufacture of AMOLED with white OLED plus color filter technology in late 2013. I believe this cooperation is mainly caused by progress by other regions in AMOLED. See our “Large AMOLED TV Summary and Comparison” of LG, Samsung, Sony, AUO, and Panasonic. In January 2013, LG Electronics officially launched the 55” OLED TV with 1080p resolution in the South Korean market, priced at about $10,000. LG later announced that it would bring the OLED TV to the U.S. market in March 2013, priced at $12,000. On the other hand, Samsung has no follow-up of when to bring its 55” OLED TV to the market yet. LG’s 55” OLED TV uses white OLED plus RGBW color filter method for the color patterning, and using oxide TFT for the backplane. Samsung’s 55” OLED TV demo uses RGB chemical vapor deposition and LTPS TFT for the backplane. Current commercialization situation confirmed that LG’s method is more achievable, or can achieve higher yield and lower cost in 2013. Sony, AUO, and Panasonic brought OLED TVs to a higher level: Ultra HD (4K) resolution. Samsung and LG’s OLED TV stayed at FHD (1080p), but they made them curved this year. With the other region’s AMOLED competition, it’s a good decision for LG and Samsung to cooperate. 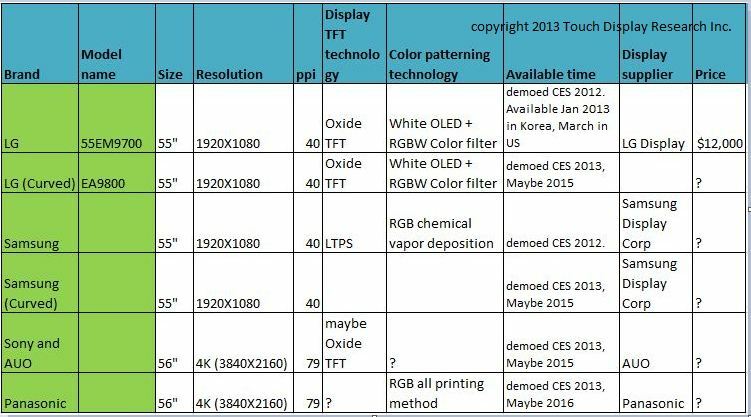 Will Samsung adopt white OLED method to only TV or to other size AMOLED? What is the pros and cons of white OLED method? Will Samsung abandon (bottle up) its other color patterning technologies? More analysis can be found in our Touch and Emerging Display monthly report. This entry was posted in Displays and tagged AMOLED, Large display, large-screen television, LCD, LG, OLED, Samsung on February 21, 2013 by jennycolegrove. At FlexTech’s 2013 Flexible and Printed Electronics conference, Plastic Logic demonstrated several flexible electrophoretic display products, including a flexible active matrix display for watches. Here are two video clips I produced about Plastic Logic demos. The first features Daniel Baum, Application Engineer at Plastic Logic, who introduced to me the large-sized flexible products and a 12 fps animated video. The second is Rachel Lichten, Head of Marketing Communications at Plastic Logic who introduces the flexible display watch. Video: Plastic Logic large displays at 2013 FlexTech Conference. Produced by Jennifer Colegrove. What’s the comparison between flexible display watches on the market or coming in the future? What’s Plastic Logic’s manufacturing status? What’s the flexible active matrix display roadmap till 2014? Detailed analysis can be found in the Touch and Emerging Display Monthly Report, February 2013 issue. This entry was posted in Conference Review, Displays and tagged conference, flex conference, flexible display, flexible electronics, flexible watch, Flextech, Plastic Logic on February 11, 2013 by jennycolegrove. 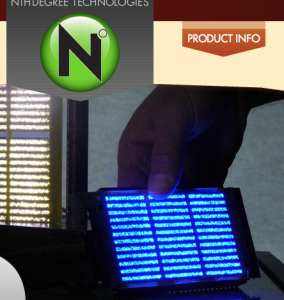 At FlexTech’s 2013 Flexible and Printed Electronics conference, Nth Degree Technology demonstrated several types of printed LED lighting. Here is a video I took with their creative director, Andrew Dennis. The flexible blue LED lighting is built on a plastic substrate, then a phosphor layer is added on top of the blue LED lighting to achieve a white light. What kind of application will this flexible LED lighting be used for? When will this lighting be in the market? What’s the comparison of printed LED lighting vs. OLED lighting vs. EL lighting? A detailed analysis will be in the upcoming issue of Touch and Emerging Display Monthly Report, February 2013. This entry was posted in Conference Review, Flexible Lighting and tagged conference, flex conference, flexible electronics, flexible lighting, Flextech, LED lighting, nth degree, phosphors on February 5, 2013 by jennycolegrove. Today was the third day of FlexTech’s 2013 Flexible and Printed Electronics Conference. It continued to be popular with five hundred attendees and sixty exhibition booths. E Ink demonstrated several flexible electrophoretic display products and color displays with front lighting at their booth. Below is a short video (2 min) of Jennifer Vail, senior marketing manager at E ink, who introduced the flexible products already in the market and future products. Video: E Ink booth at 2013 Flexible and printed Electronics conference. Video producer: Jennifer Colegrove, Touch Display Research Inc.
What product was LG’s first flexible display used on? When will E Ink’s own flexible active matrix display hit the market? What is the flexible active matrix display roadmap from now until 2014? A detailed analysis will be in the upcoming Touch and Emerging Display Monthly Report, Feb 2013 issue. This entry was posted in Displays on February 1, 2013 by Steve Colegrove.